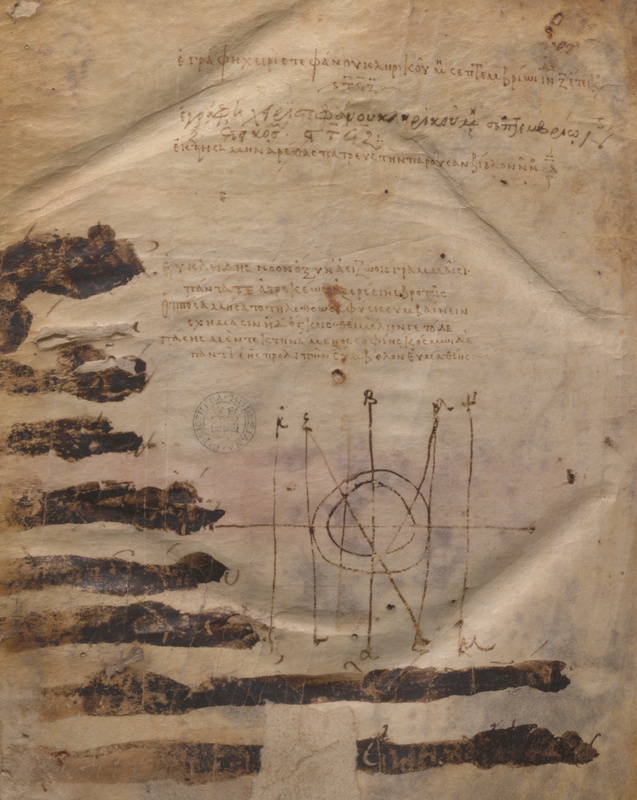 The Clay Mathematics Institute (CMI) thanks the Bodleian Library and Octavo for making these digital resources available to the interested public, educators, mathematicians, and historians. CMI is grateful to Mark Schiefsky and David Camden for providing the original index by propositions keyed to the manuscript, and to Henry Mason of Merton College, Oxford, for extending their work and incorporating the high resolution images. The books digitized by Octavo can be found in the Rare Book Room, a digital library of rare books established by Dr. John Warnock. Libraries without Walls continues the digitization activities begun by Octavo under a non-profit structure. All the digital versions of the Bodleian Euclid manuscript derive from the 2004 digitization project. The image is of the page on which Stephen the Clerk (the scribe) signs his name and Arethas of Patras (the original owner) says he bought the book for 14 gold coins.